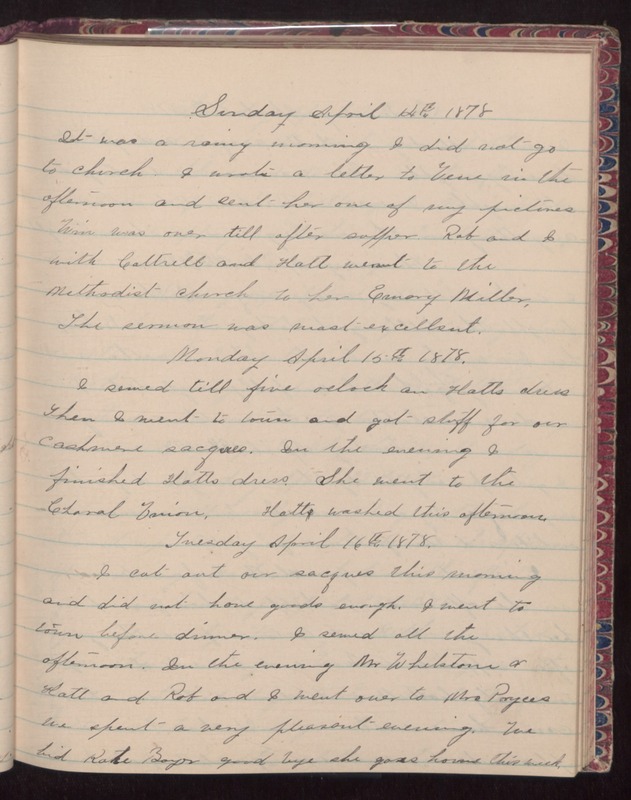 Sunday April 14th 1878 It was a rainy morning. I did not go to church. I wrote a letter to Gene in the afternoon and sent her one of my pictures. Win was over till after supper. Rob and I with Cattrell and Hatt went to the Methodist church to her Emory Miller. The sermon was most excellent. Monday April 15th 1878 I sewed till five oclock on Hatts dress. Then I went to town and got stuff for our cashmere sacques. In the evening I finished Hatts dress. She went to the Choral [illegible]. Hatt washed this afternoon. Tuesday April 16th 1878 I cut out our sacques this morning and did not have goods enough. I went to town before dinner. I sewed all the afternoon. In the evening Mr Whilston [?] and Hatt and Rob and I went over to Mrs Poyces [?]. We sent a very pleasant evening. We bid Kate Boyer good bye she goes home this week.